Nebraska Revised Statute 79-760.01 requires the Nebraska State Board of Education to “adopt measurable academic content standards for at least the grade levels required for statewide assessment.” Those standards shall cover the subject areas of reading, writing, mathematics, science, and social studies, and the State Board of Education shall develop a plan to review and update standards for those subject areas every seven years. In addition to the content area standards required by statute, the Nebraska Department of Education has developed content area standards for fine arts, physical education, health education, and world languages, as well as course-based standards for Career and Technical Education. Although not required by law, these content area standards provide a framework for quality teaching and learning for all content areas. The review and revision of content area standards will be completed by the end of the seven-year cycle. The review and revision process may take up to 1.5 years to complete. Most review and revision processes will begin in the fall and be completed by the following fall. Pursuant to Nebraska Revised Statute 79-7601.02, school districts will have one year to adopt the state-approved content area standards or adopt content area standards deemed as equal to or more rigorous than the state-approved content area standards for reading and writing (English Language Arts), mathematics, science, and social studies. School districts are encouraged to adopt the state-approved standards in other content areas (fine arts, physical education, health education, and world languages) within one year of being adopted by the State Board of Education. Career and Technical Education content area standards will be reviewed and revised on a five-year cycle in order to remain current with occupational demands/standards. 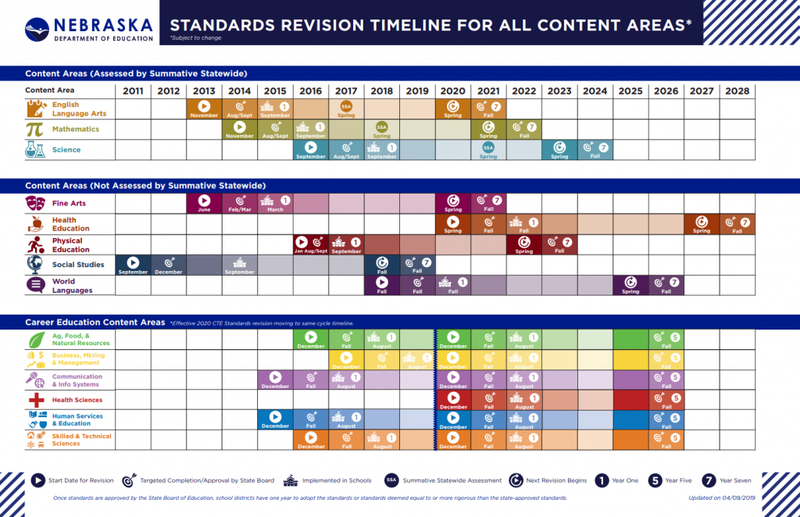 Download the Standards Revision Timeline for all content areas. If you have questions or need more information, please contact Dr. Cory Epler, Chief Academic Officer (cory.epler@nebraska.gov). On September 5, 2014, the Nebraska State Board of Education adopted Nebraska’s College and Career Ready Standards for English Language Arts. Other formats and the 2009 Nebraska ELA Standards are located on the English Language Arts Webpage. On September 4, 2015, the Nebraska State Board of Education adopted Nebraska’s College and Career Ready Standards for Mathematics. Other formats and the 2009 Nebraska Mathematics Standards are located on the Mathematics Education Webpage. On September 8, 2017, the Nebraska State Board of Education approved Nebraska’s College and Career Ready Standards for Science. Other formats are located on the Science Education Webpage. On March 4, 2014, the Nebraska State Board of Education adopted the Nebraska Fine Arts Standards. Other formats are located on the Fine Arts Education Webpage. On October 7, 2016, the Nebraska State Board of Education adopted the Nebraska Physical Education Standards. The 2006 Nebraska Physical Education Essential Learnings are located on the Physical Education Webpage. The Health Education Standards and the Nebraska State Board of Education Policy for Coordinated School Health, are located on the Coordinated School Health Webpage. On December 7, 2012, the Nebraska State Board of Education approved the Nebraska Social Studies Standards. Other formats are located on the Social Studies Education Webpage. In 1996, the Nebraska World Language Essential Learnings were developed. Other information is located on the World Language Education Webpage. In December 2018, the Nebraska State Board of Education approved content area standards for Business, Marketing, and Management. These standards will be linked from the Career Education Standards Website in the summer of 2019. In November 2017, the Nebraska State Board of Education approved content area standards for the following Career Fields. These standards were linked to the Career Education Standards Website in the Summer of 2018. In 2013, the Nebraska State Board of Education adopted the Nebraska English Language Proficiency (ELP) Standards. The ELP Standards highlight the critical language, knowledge about language, and skills using language that are necessary for English Language Learners (ELLs) to be successful in school. Other information regarding the ELP Standards and the ELPA 21 Assessment is located on the Title III Homepage.